The following was taken from The Historic Perry Norwegian Settlement. The Perry Historical Center, Daleyville. 1954: This was the first post office in the area now known as the Township of Perry. The site was called "Turkey Grove" and was first settled by a Virginian named S.C. Campbell. 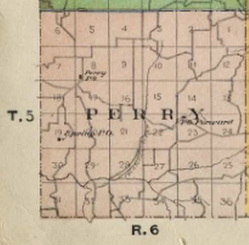 Older plat maps show Campbell's farm in the Southwest corner of Perry in Section 34. The map to the right show the post office in Section 19. By 1890 it no longer appeared on the plat map. The 1890 plat map (right middle) shows a "Willow Spring Farm" in the approximate location on the 1873 Dane County map. The Sunnyside Cheese Factory is in the same vicinity. From Wisconsin Post Office Handbook, revised edition No. 3, Frank Moertl, 1999, another post office named Spring Post Office opened in 1896 closing in 1900 with Gottlieb Grunder as postmaster. It is also shown in the Wisconsin Blue Book in 1889 and then in 1897 and 1899. According to the 1899 plat map, the farms served by Spring Post Office (not named on the map at bottom right) were located in section 1-5, and 9-12 which is in the area of Spring Valley Cheese Factory, School, and Holy Redeemer Catholic Church. The post office was probably in or near one of the sites. (see below). The names outlined in red on the map are also outlined in red on the list below. 1873. Spring Post Office noted just below and to the left of "Perry" in Section 19.